Jean-François Michel, a virtuoso trumpeter, is currently professor of trumpet at the Fribourg Conservatoire in Switzerland. Before assuming this post, he was principal trumpet in the Munich Philharmonic Orchestra. Gradually, composing is becoming his major activity and his numerous original compositions are being performed and recorded worldwide. He has penned a number of works for trombone including: Three Bagatelles for bass trombone and piano, Choral et Toccata for six trombones, Emeraude for trombone quartet, Sinfonietta for nine trombones, Trois Tableaux for solo trombone and trombone quartet and Eastwind for trumpet, trombone and piano. This three movement work, composed for two trombones and piano, is highlighted by dramatic and poetic intensity, punctuated by various sound combinations (including mutes) and amazing rhythmic effects. The piece is dedicated to the well-known soloist Branimir Slokar and the talented Japanese trombonist Mayumi Shimizu. 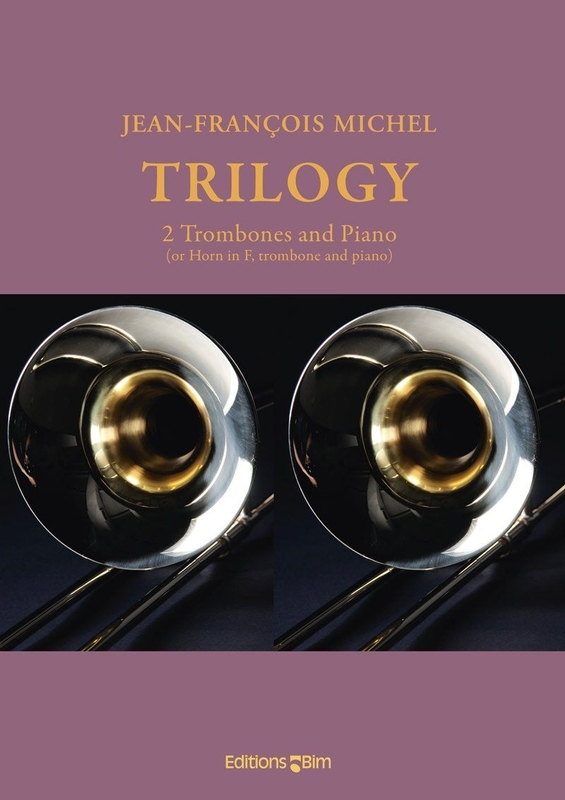 The combination of two trombones is quite unusual in terms of available repertoire, so the publisher includes a version for horn, trombone, and piano. Since the two solo parts are more or less equal, the trombone does not take a back seat in this version. It does take three advanced performers to bring this off, as it presents a number of rhythmic, technical, and sound color challenges. With its rousing conclusion, Trilogy can serve as a wonderful closer on a graduate or faculty recital. As is the norm for Editions Bim publications, the paper quality, printing, and artwork are all first class.